Richard Riland became Rector of Sutton Coldfield on the death of his father at the age of 25 in 1720. He had been born in the vast old medieval rectory, which his father John had moved into on becoming Rector in 1690 - it was demolished and replaced with a modern building in the Queen Anne style in 1701. Sutton Rectory was held by members of the Riland family until 1913. W.K.Riland Bedford, a Victorian Rector of Sutton, published a history of his family in 1889, “Three Hundred Years of a Family Living” (perhaps he expected the line to continue until 1990). The account of the family is of limited interest to us now, except that the bulk of the book consists of correspondence. The letters to and from family members often contain fascinating pieces of local gossip which give an insight into the everyday life of genteel society in Sutton. Richard Riland, writing from Sutton to his son in 1755, mentions two houses being burnt down “beyond Hill in this Parish” leaving the families destitute “no life being lost but that of a goose”; and there was the tragedy of two toddlers drowning in a well in the Reddicroft to report. He gives his letter to Mr. Bagnal to post, who is “walking with Mrs. Sawyer to Birmingham to attend a concert and ball for the benefit of Mr. Eversman”. The very first letter in “three hundred Years” is of a different character - it is a proposal of marriage. Mary Bisse was visiting Bath in 1729 when Richard Riland first met her - he was 34, she was about 26 years old. How often they met is unknown, but Richard’s letter to her at her uncle’s house in London is dated 22nd April 1729. He refers to an offer he was going to make, and continues “It is that of a husband; if you are not better provided, I am at your service.” After referring to money matters, “True Happiness does not consist in a Multitude of Riches; a genteel sufficiency will entitle the Possessors of it to all the Privileges and Advantages that wise and good men can desire.” He has received a good account of her from her friends but his strongest inducement is the “Quality I had daily opportunities of observing myself at Bath; and is I think, the Perfection of All”. He concludes by saying that he already has the consent of her uncle with whom she lives, and expects to call on her the week after next. Proposals of marriage in writing are often met with in novels, but this is a genuine (and successful) one. Minor events figure in a letter to his son in 1750 - “Your mother fell down four or five steps of the stair to the parlour Door”; “On Thursday night we had the most furious and tempestuous wind ever known here…Thomas Bonell was upon the Coldfield in the most raging time of it, being sent on a very necessary errand to Birmingham for a midwife to hi Bonella”. Richard Riland died in 1757, being succeeded at the Rectory by his son Richard Bisse Riland. 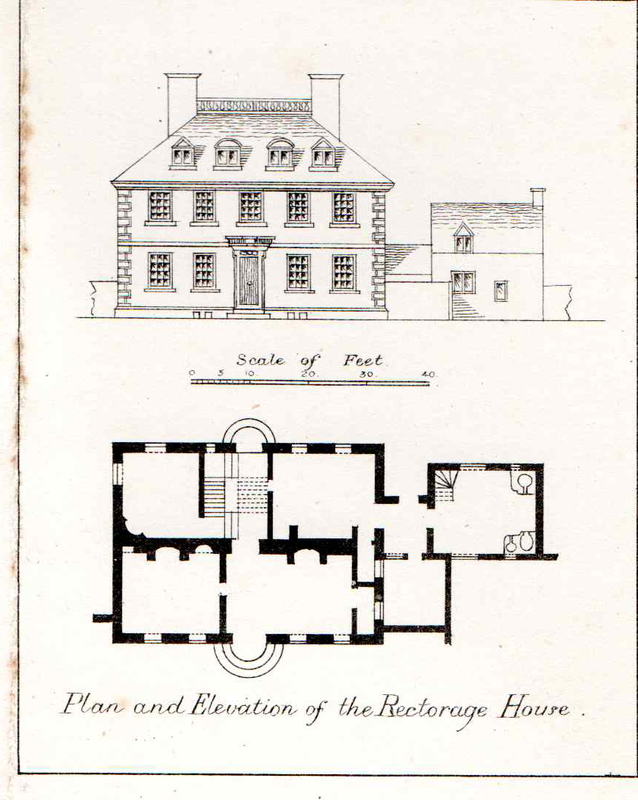 Detail from a map of the glebe land belonging to the Rectory, by John Snape, 1761, showing the house he hoped to welcome Miss Bisse to. Richard Riland was a wealthy man, but wrote in his proposal letter that his fortune “is neither small nor indeed very great, yet such, I doubt not, as might be abundantly sufficient to support a Family without the Addition of a plentiful Fortune with a Wife, but in Conjunction with yours (which what it is I am ignorant of) there will be enough not only for Convenience or Necessity, but even for Pomp and Luxury”.